Programs that provide high-quality summer literacy instruction to low-income students can sustain and even improve reading skills for students at high risk of summer slide. In doing so, they can help narrow the achievement gap. 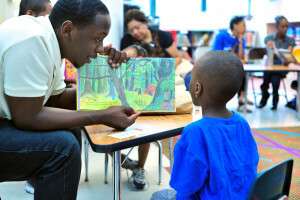 Springboard Collaborative, a nonprofit based in Philadelphia, runs a five-week intensive summer literacy program for students and their families. Springboard’s model takes a hands-on approach to involving parents – not just teachers and students – in literacy learning. Since its 2011 launch as a pilot with 42 students, the program has grown to serve over 1,200 students in 20 schools in low-income communities across Philadelphia and neighboring Camden, NJ. Springboard will also be launching a site in Oakland, California in summer of 2015, increasing the number of students served to over 2,000. Before programming begins, teachers in the Springboard summer literacy program visit each of their students’ homes to meet and build buy-in from parents. Students then attend daily half-day literacy classes, capped at 15 students each, for five weeks. Students are grouped by reading level rather than grade level to allow teachers to focus instruction. Once a week, teachers also lead family workshops, where parents learn how to choose appropriate books for, and co-read with, their children. Parents and children alike are encouraged to read at home, both together and separately. Springboard incentivizes parents and children by offering “learning bonuses” – free books, school supplies, and even tablets – at the end of the program, based on both student growth and parent attendance. Throughout the five weeks, a school-based Site Manager coaches each teacher to ensure all classrooms reach the finish line. Springboard Schoolyear, piloted in the 2013-2014 academic year, which trains teachers to target instruction and coach families in order to accelerate struggling readers’ progress during the academic year. This intervention spans the 3rd quarter of the school year and features a combination of teacher coaching, small-group instruction, family training workshops, and incentives. Springboard Schoolyear is geared toward students who need the most support to make reading gains each year. Springboard@home, to be piloted in 2015, which provides an alternative to the five-week summer literacy program for higher-performing students. Participating families receive customized libraries and literacy training to maintain and develop their children’s reading skills over the summer. This intervention combines access to a leveled library, weekly online workshops, interactive content, and incentives. Parent Engagement and Skill-building: Students in low-income communities often lack continuous access to learning at home and school, which can result in slow progress during the schoolyear and chronic regressions over the summer. Springboard’s model is built on the idea that parents play a critical role in enabling children to make academic progress both in and out of school. In order to equip parents and families to support their child’s learning, Springboard Summer offers weekly workshops that train caregivers on how to pick a book on their child’s reading level and what to do before, during, and after reading. Over 90% of families attend these weekly training workshops during the summer program. The total cost of providing Springboard Collaborative’s summer program to a child ranges from $950 to $1,000 depending on the particular site’s expenditures for teacher pay and the per-pupil fee to the program. Based on the program’s current cost structure and impact results, we estimate that the program costs between $979 and $1,020 per incremental student avoiding summer slide. Because much of the cost is covered by the district and school partners, it is worth noting that the philanthropic cost per impact of Springboard’s summer program ranges from $25 to $351 per incremental student avoiding summer slide. For additional information, visit our page on linking cost and impact. Take Action: Visit Springboard Collaborative to find out more information about its programs, district sites, and school partners. 1 A meta-analysis by Cooper, et al, reviews 39 studies spanning 90+ years (download full text). Cooper, H., Nye, B., Charlton, K., Lindsay, J., & Greathouse, S. (1996). “The effects of summer vacation on achievement test scores: a narrative and meta-analytic review.” Review of Educational Research, 66 (3), 227-268. 6 Based on assessment data captured by participating teachers and administrative staff. 7 Based on assessment data captured by participating teachers and administrative staff. 8 Based on assessment data captured by participating teachers and administrative staff.